At left is an optical view of M83. At right is a composite image showing X-ray data from Chandra in pink and optical data from the Hubble Space Telescope in blue and yellow. The ULX is located near the bottom of the composite image. A NASA space telescope has detected an incredible energy burst from a distant black hole, an explosion so intense that it boosted the black hole's X-ray brightness by at least 3,000 times, scientists say. The outburst came from a black hole in the spiral galaxy M83, about 15 million light-years away from Earth. Using NASA's Chandra X-ray Observatory, astronomers found a new object, called an ultraluminous X-ray source (ULX), that emits more X-rays than most "normal" systems in which a companion star orbits around a black hole or neutron star, the researchers said. The observations from Chandra spanned several years, and scientists noticed that the ULX in M83 increased its X-ray brightness by at least 3,000 times. In the accompanying image, the left is an optical view of M83. On the right is a composite image showing X-ray data from Chandra in pink and optical data from the Hubble Space Telescope in blue and yellow. The ULX is located near the bottom of the composite image. 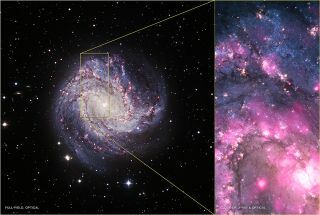 Optical images of the black hole in M83 were taken by the European Southern Observatory's Very Large Telescope in Chile. These images revealed a bright blue source where the ULX is located during the X-ray outburst. Yet, before the outburst, this blue source cannot be seen, the scientists said. An X-ray image of the spiral galaxy 83. The discrepancy suggests that the companion to the black hole in M83 is a red giant star that is more than 50 million years old. The mass of this object is less than four times the mass of the sun, and according to theoretical models that predict the evolution of stars, the black hole in M83 should be almost as old as this companion red giant star. The bright blue emission that could be seen during the X-ray outburst could be the black hole's disk brightening significantly as it acquires more material from its companion star, the astronomers said. Another strangely behaved ULX from a black hole with an old, companion red giant star was found recently in the galaxy M31. These new discoveries in M83 and M31 show that there could be a population of similar black holes that are older and more volatile, the researchers said. The mass of the ULX in M83 is estimated to be between 40 to 100 times the mass of the sun. The astronomers also found that the black hole in this system may have formed from a star surprisingly rich in "metals," or elements that are heavier than helium. Based on previous observations, the ULX is located in a metal-rich region. Large concentrations of metals increase the rate of mass lost from massive stars, siphoning mass before they collapse. This also decreases the mass of the resulting black hole. Current theoretical models suggest that in regions highly rich in metals, only black holes with masses less than about 15 times that of the sun should form. As a result, the findings based on the ULX in M83 could dispute these models, the researchers said. Another plausible explanation is that the black hole is so old that it formed at a time when heavy elements were much less abundant in M83, before metals were sprinkled throughout by later generations of supernovas. Astronomers are also investigating the possibility that the mass of the black hole in M83 is only about 15 times that of the sun.